The Logitech G7 went down the route of 2 seperate batteries that could only be used in the G7. Only one battery could be used at a time, so while that was in use the other could be recharged in the charging dock, which also had a USB port for the USB receiver. It worked well, but could be a bit annoying when the battery ran out of juice mid-way through a game or work, but it only took a couple of seconds to swap. At first the batteries lasted around 7-8 hours each between charges which was more than enough generally for 2-3 days of use. But over the years the battery life has shrunk to less than an hour on both which made the mouse more and more frustrating. 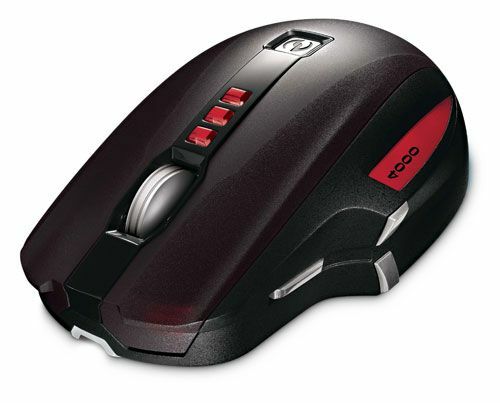 Unfortunately as good as the mouse was, very comfortable and with a relatively good sensitivity (2000dpi), new batteries for the mouse would of cost around the same as what the moues is worth second hand. So for the second time since owning the G7 I went out looking for a new mouse. My first outing resulted in buying the corded Razer Lachesis. That didn't last long though, the feel of the mouse was wrong, the mouse was too light and the shape of the buttons never felt right as well some issues with the mouse not being usable upon Windows start up which I imagine was down to drivers. So now the Microsoft Sidewinder X8 is in, same price as both the Razer Lachesis and the Logitech G7 but is packed with a lot more features. It comes with one standard rechargable AA battery, so the battery can be charged using a standard battery recharger or the more useful and usable charger that also acts as a receiver. In what looks like a hockey puck is a small wire wrapped around the middle with a small pad with 3 metal elements on it. 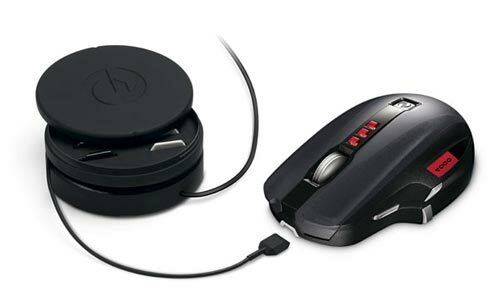 This attaches magnetically to the bottom of the mouse but in such a way as not to pull off easily. This provides a charging facility over USB which is great as when the battery is running low, you can just plug the cable in and carry on as normal, then when the battery is charged up, just take the cable out and carry on, no changing batteries required here. Another nice touch is that in the hockey puck like receiver is a set of 2 feet for the mice with different levels of slipperiness to go with the standard feet on the mice, so you have 3 sets of feet. 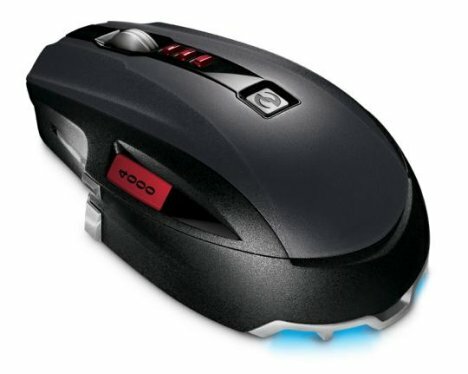 The mouse has different resolution settings like the G7 and Lachesis but like the Lachesis goes all the way to 4000dpi. The Lachesis and G7 have 2 buttons below the scroll wheel to go up and down the sensitivity settings, the X8 offers 3 buttons allowing 3 different settings. The X8 also features a nice LED screen next to the thumb which tells you the DPI as well as the battery charge state, I feel it would of been better to be more like the G7 and allow more than 3 settings and to be able to scroll through as you would easily be able to tell which sensitivity you are on by looking at the LED screen. The scroll wheel on the X8 feels very solid with a textured metal finish allowing good grip which although I think it shouldn't, actually feels better than the rubber used on both the Lachesis and G7 and gives a reassuring click sound when pressed. So far I highly recommend the X8 at the moment I would say it is a better mouse than the G7 and definately better than the Lachesis from my experiences, but only time will tell.